Enjoy all you need in one account: a modern payment tool, an easy way to bank on the go and the security of monitoring all your transactions instantly. banki digital services: Bank your way from your smartphone, tablet or computer wherever and whenever you choose. 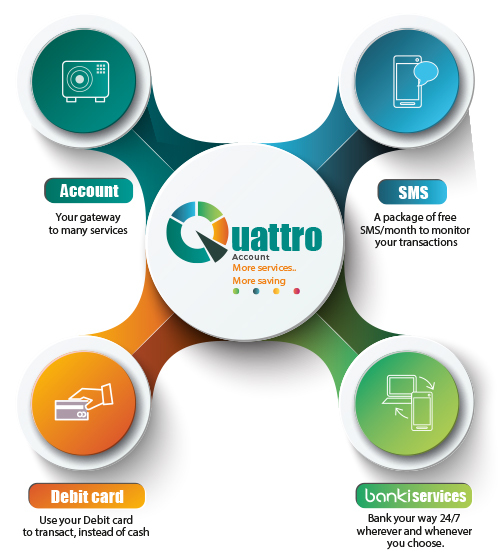 This new Tariff includes all services comprised in the Quattro Account (account, debit card, SMS, banki services). It is applicable on Individual EGP accounts only and excludes the payroll customers. * The Bank’s standard tariff will apply on sub-accounts.